This program generates tones and colors as you tilt or move the phone around. In this little app electric arcs are generated from where you touch the screen. Slide your finger to the left to start the shaver, slide it to the right to switch it off. Got a decision to make? Flip a coin! This simple application lets you flip a coin and watch it randomly land on heads or tails. 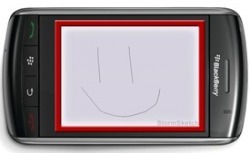 This is essentially an Etch-a-sketch for your BlackBerry if you remember what that is. You draw on the screen using your finger and then shake it left and right to clear the screen. Cool little app for the Storm puts a lightsaber on your screen. When ever you move your phone from side to side it makes a sound FX like a lightsaber. You can choose from different colors for the lightsaber as well. Here is a simple little app for the Storm, It simulates a dice. You slide your finger across the screen to roll the dice. Sliding the finger up or down will roll the dice, but without sound. Sliding it left or right will also roll the dice but with a sound effect. This is is a fun application that makes your screen dirty and has a sponge or mop to clean it up. The cleaning apparatus floats free and is controlled by the Storm’s accelerometer. Every time you clean the filth off the screen, you get a little vibration. The kick is, once you clean the screen, it becomes dirty again! It is never over! Here is a gag program that makes farting sounds on your BlackBerry. f you like to draw or maybe you just like to doodle, SpinPen is a unique new drawing tool for BlackBerry that takes advantage of the Thumbwheel on your BlackBerry to draw. Point the pen in the direction you want to draw and move the pen to draw a line.